Fred Madiot: How to share a modeling project with other users? 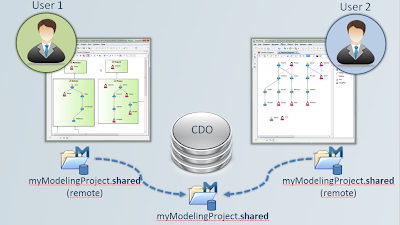 In a previous post, I illustrated the Collaborative Modeling mode provided with Obeo Designer 6. It allows several users to simultaneously edit a model and its diagrams. Thanks to the fine-grained locking mechanism, only the concerned model elements are locked, and automaticaly released once the modifications are saved. Now, I will explain how to share a local modeling project on a server, in order to use this collaborative mode and to allow other users to collaborate with you on the same model. To share a model with several users, only three steps are needed with Obeo Designer. The shared model must be hosted on a CDO server which has to be installed and started. This can be done very easily with the sample CDO servers provided with Obeo Designer. These servers are available through Obeo Designer examples and can be launched with prebuilt Launch Configurations. This video illustrates how to proceed. Of course, for a large project, with important constraints, you will have to configure and administrate your own CDO server. 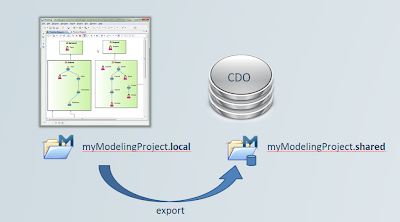 Once the server has started, you can use it to export a local Modeling Project. This will copy your local project on the server and make it available for other users. Then, this project can be used in a collaborative mode by any other user who can connect to the CDO server. 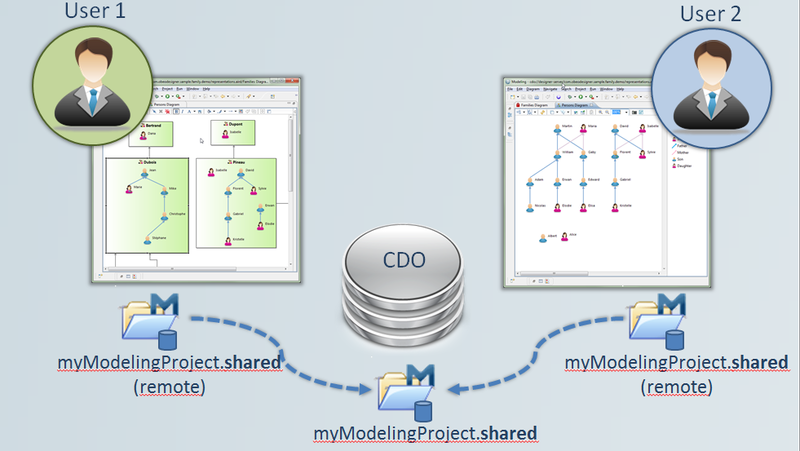 When a modeling project has been shared on a CDO server, other users can work with it in a collaborative mode. They just have to locally create a new Shared Modeling Project which points to the project hosted on the server. This Shared Modeling Project is directly connected to the server and reflects all the changes done by all the other users on the same model.